Looks like the long arm of the law is trying to diddle Wikipedia into submission. 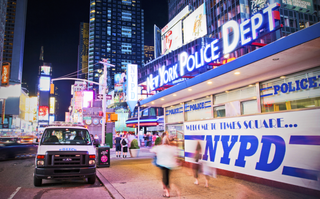 Members of the NYPD are trying to scrub Wikipedia's entries about police violence. Computer users identified by Capital as working on the NYPD headquarters' network have edited and attempted to delete Wikipedia entries for several well-known victims of police altercations, including entries for Eric Garner, Sean Bell, and Amadou Diallo. Capital identified 85 NYPD addresses that have edited Wikipedia, although it is unclear how many users were involved, as computers on the NYPD network can operate on the department's range of IP addresses. It isn't the first time people in power have been caught trying to make the crowdsourced encyclopedia reflect their reality. People have tracked the edits Congress makes to Wikipedia. But in that instance, most of the edits were for weirdo entries like "horse head mask" rather than articles that directly referred to Congressional misconduct. On Nov. 25, 2006, undercover NYPD officers fired 50 times at three unarmed men, killing Sean Bell, and sparking citywide protests against police brutality. On April 12, 2007, a user on 1 Police Plaza's network attempted to delete the Wikipedia entry "Sean Bell shooting incident". "He [Bell] was in the news for about two months, and now no one except Al Sharpton cares anymore. The police shoot people every day, and times with a lot more than 50 bullets. This incident is more news than notable," the user wrote on Wikipedia's internal "Articles for deletion" page. The matter is "under internal review," according to an NYPD spokesperson.